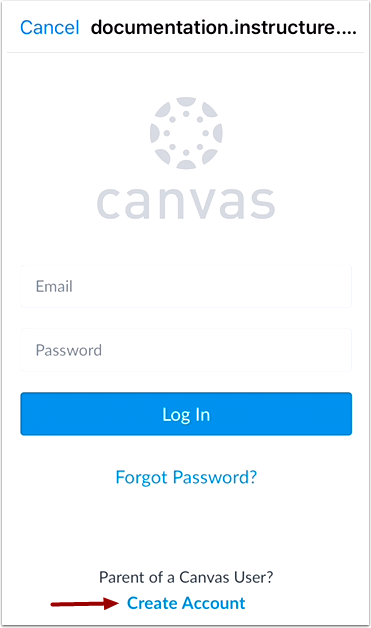 How do I create an account in the Canvas Parent app on my iOS device? 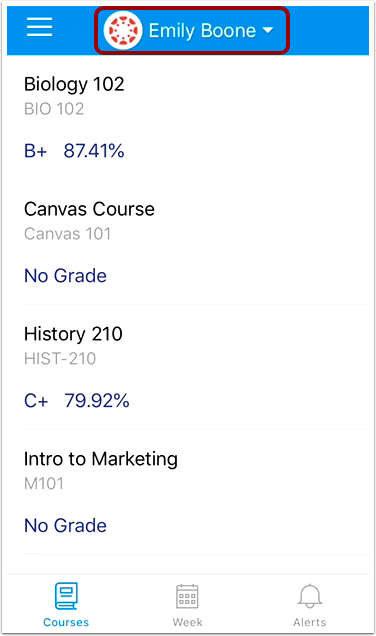 In the Canvas Parent app, you can create a Canvas observer account to view student course information. If you already have an account, you can log in to the Parent app. To link yourself to a student, you will need to enter a student-specific pairing code that will link you to the student. Pairing codes are valid for seven days. Students can generate pairing codes from their User Settings. Depending on institution permissions, admins and instructors may also be able to generate pairing codes. For more information on pairing codes, view the Pairing Codes - Frequently Asked Questions PDF. 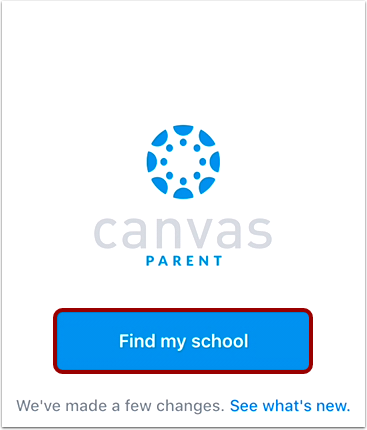 Open your device and tap the Canvas Parent icon. 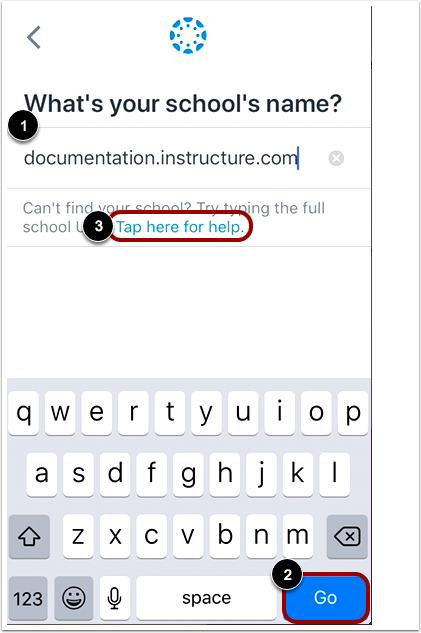 To find your institution, tap the Find my school button. If you don't know your Canvas URL, tap the Tap here for help link . To create an account, tap the Create Account link. Note: If the Create Account link account does not display, your student's institution has disabled creating accounts for observers. Enter your name in the Your Name field  and email address in the Your Email field . Then create a new password by entering it in the Password field . Confirm your new password in the Re-enter Password field . 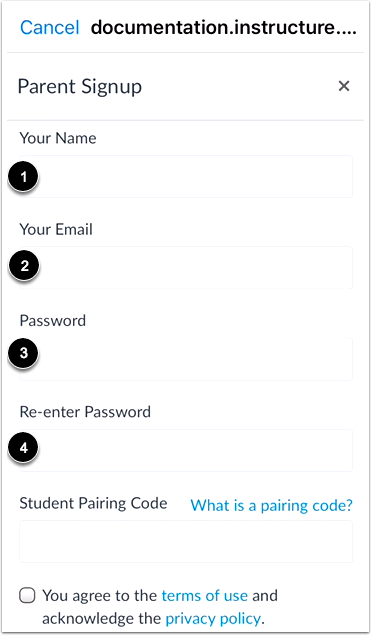 Enter the six-digit alphanumeric pairing code for the student you want to link to in the Student Pairing Code field. Note: Students can generate pairing codes from their User Settings. Depending on institution permissions, admins and instructors may also be able to generate pairing codes. 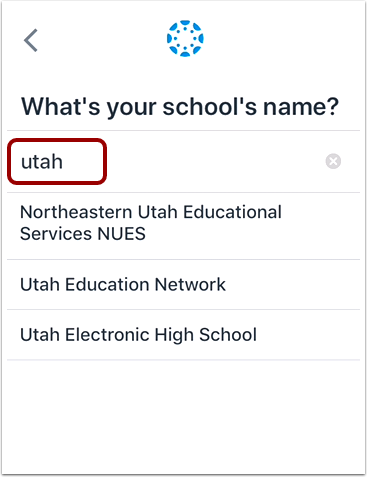 View your linked student in the Canvas Parent app. Previous Topic:How do I download the Canvas Parent app on my iOS device? Next Topic:How do I log in to the Canvas Parent app on my iOS device? Table of Contents > Observers > How do I create an account in the Canvas Parent app on my iOS device?